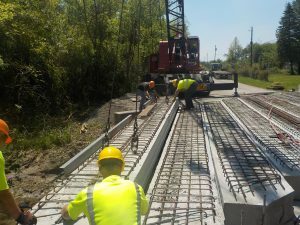 While labor, equipment and material costs rise on an annual basis, the major funding sources for roads and bridges in Allen County hasn’t increased in decades. For example: Allen County residents have not seen an increase in permissive license plate fees since its inception in 1968 (50 yrs). Ohio license plate fees haven’t increased since 1988 (30 yrs), the federal gas tax has not increased since 1993 (25 yrs) and the Ohio gas tax hasn’t increased since 2005 (13 yrs). Realizing the poor condition and need for repairs to our roads and bridges, on June 28, 2018, the Allen County Commissioners agreed to increase the permissive license plate fees for Allen County residents. This permissive license plate fee was increased by $5 to all Allen County residents when license plates are renewed after January, 2019. In addition, county residents outside of Lima or Spencerville will see an additional $5 fee for the same purpose. 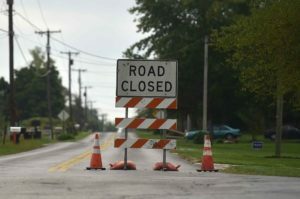 Residents inside Lima and Spencerville have already been charged this fee for municipal upgrades for years and therefore will not be affected. These increased fees are expected to generate about $740,000 annually and can only be used for road and bridge improvements according to law. Bids were opened for the construction of a new Slabtown Road bridge Monday, July 2, 2018. The new Bath Township bridge, BTH-165-3.22, located 0.12 mile north of Sugar Creek Road, will replace a truss bridge built in 1941. The low bidder was R & I Construction of Tiffin, OH at $521,692.50. Construction of the new bridge should be completed in late October. On June 22, 2018, bids were opened for the 2018 contract paving throughout the county. The Shelly Company of Findlay, OH was the low bidder. Their winning bid of $1,117,914.56 for 12 miles of paving also includes various asphalt planning, lane striping, traffic maintenance and mobilization. 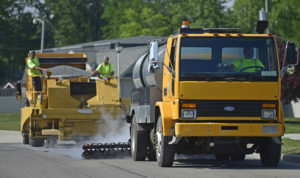 Revenue for this work is primarily from State of Ohio Issue 1 Ohio Public Works Commission (OPWC) funds, and Allen County townships also pay their portions. Work should be completed by November. The Allen County Engineer and the 12 Townships collectively maintain 352 and 550 miles of roads, respectively. Unfortunately, most of the roads are in disrepair and there isn’t enough money to fix them. 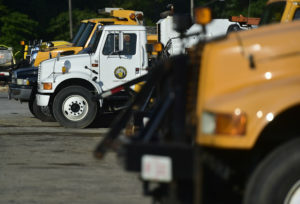 Therefore, every Spring the County Engineer and the Township Trustees evaluate the conditions of every road in the County. Once the condition ratings are established, these agencies meet to prioritize which roads need to be fixed with the limited resources available. A meeting of all township trustees, the Allen County Engineer and Allen County Commissioners was held on Tuesday, April 17th at 11 A.M. at the Allen County Engineer’s Office, 1501 N. Sugar Street, Lima, Ohio. The meeting was to discuss and finalize the 2018 Road Programs for township, village and county road work in Allen County. At the meeting, County Engineer Brion Rhodes reviewed the totals for road work for the county, twelve townships and six villages. The Allen County Commissioners passed a resolution approving the 2018 Road Program at their regular agenda meeting Thursday, April 19, 2018. Allen County Engineer’s road crews will begin work on the 2018 Road Programs in May. 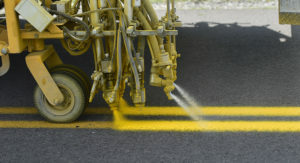 The Sherwin-Williams Company was this year’s low bidder for the traffic paint needed throughout Allen County. 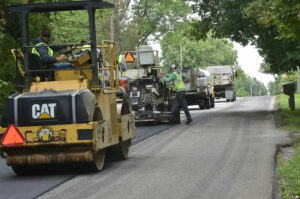 The Allen County Engineer’s Office will stripe the centerlines of 308 miles of roadway, including over 200 miles of county roads and over 100 miles of township and municipal roadways. Additionally, over 30 miles of edge lines will also be painted. The winning bid of $51,438.75, was about a $1400 increase from last year’s cost. The Allen County Engineer and the 12 Townships collectively maintain 352 and 550 miles of roads, respectively. Unfortunately, most of the roads are in disrepair and there isn’t enough money to fix them. Therefore, every Spring the County Engineer and the Township Trustees evaluate the conditions of every road in the County. 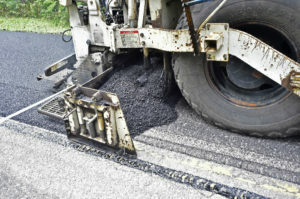 Once the condition ratings are established, these agencies meet to prioritize which roads need to be fixed with the limited resources available. This decision making process started this week and will be finalized at the Annual Road Program meeting on Tuesday, April 18, 2017, at 11:00 A.M. at the County Engineer’s Office. It’s spring time again and the Allen County Engineer, Brion Rhodes and his staff have completed the annual inspection of all 377 bridges under the County’s responsibility. 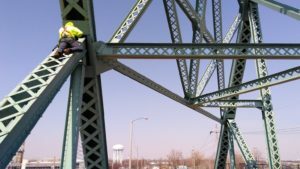 While this is no small feat and takes an entire year to complete, 22 of these bridges are designated as “fracture critical” and require an additional biennial inspection, where each bridge is thoroughly examined. Most notable of these 22 bridges is the Metcalf Street Bridge over the Norfolk and Southern rail yard near the Husky Lima Refinery. It was built in 1923, but continues to be Allen County’s longest structure, containing five (5) separate spans and the main truss spanning of 308 feet. Regardless of the size, rest assured, the Allen County Engineer is dedicated to maintaining safe bridges. The Allen County Agricultural Society named the Allen County Engineer’s Office as the Outstanding Fair Supporter of the Year for 2016. Allen County Engineer, Brion Rhodes and his staff have been instrumental in several projects at the fairgrounds. Campground renovations, drainage/ditch repairs, utility repairs, parking/driveway upkeep, racetrack maintenance and surveying, have all been major contributions to the success of the Allen County Fair. The Allen County Engineer’s Office has also provided shared equipment and services throughout the year. Earlier this year, the Allen County Engineer’s Office was awarded $586,100 ($310,300 grant and $275,800 loan at 0% for 20 years) from the Ohio Public Works Commission (OPWC) to replace the Zurmehly Road Bridge over the Little Ottawa River in Shawnee Township. The existing bridge (located just east of Shawnee High School) was a 62’ long, 20’ wide steel truss built in 1950 and was structurally deficient. The new bridge is a pre-stessed concrete box beam bridge 78’ long, 32’ wide, which is much safer for the traveling public. The OPWC released funding on July 1 and we opened bids that same day. Three companies bid on the project and the lowest bid was R.G. Zachrich Construction Inc. from Defiance, Ohio with a total bid price of $511,305.59. Construction started on August 15 and the bridge was re-opened on October 27th, over two weeks ahead of schedule. Special thanks goes to the public and especially Shawnee Schools for their understanding, patience and cooperation during the construction. On Thursday, August 6th, the Allen County Republican Central Committee unanimously appointed Brion E. Rhodes as the next Allen County Engineer. 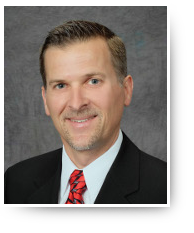 Brion had been appointed as the Interim County Engineer by the Board of Allen County Commissioners on July 30th to fill the vacancy created when former county engineer Tim Piper retired on July 31st. Brion has been Chief Deputy Engineer for Allen County since 2009. To read more, click HERE for the Lima News article.